Beautiful and Rare, Springfield Township discusses an endangered butterfly, pictured above by CMU Research Assistant Michael Belitz. The largest known population of the Poweshiek Skipperling in the world is found amidst a tranquil and secluded patch of protected prairie fen. The prairie fen was formed after the last retreating glacier sculpted our landscape some 10,000 years ago. It’s right here on the wilder side of Oakland County and is perhaps the very last stronghold for this species on Planet Earth. 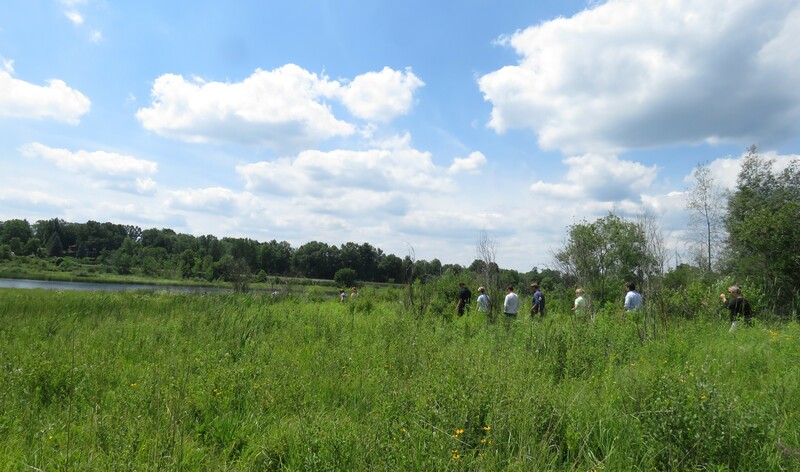 The Michigan State University Extension Service describes prairie fens. 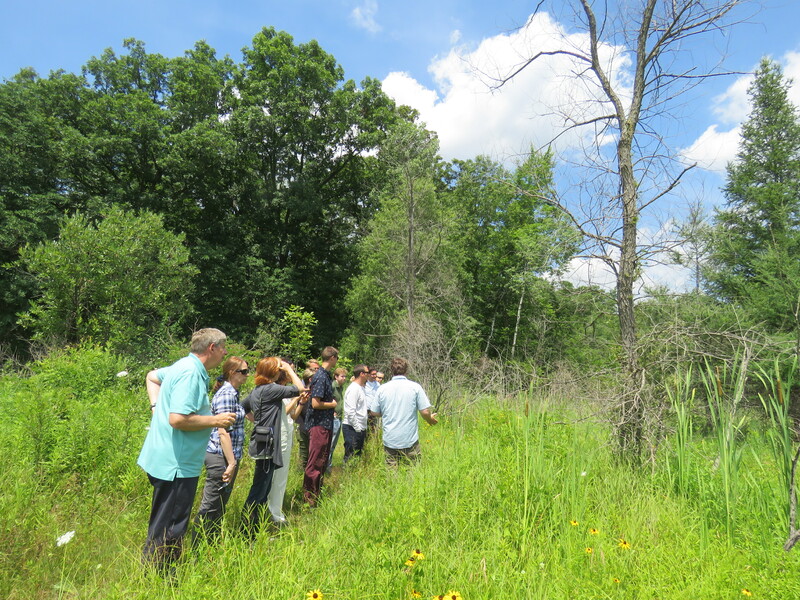 With those facts in mind I joined Mike Losey, the Nature Resources Manager of Springfield Township and a dozen members of ​​​​​​​​​​Oakland County’s Trail, Water & Land Alliance for a behind the scenes tour of the Davis Lake Overlook. The Davis Lake Overlook encompasses approximately 40-acres and is part of Springfield Township’s 515-acre Shiawassee Basin Preserve. The property includes remnants of oak savanna habitat, mature oak-hickory woodlands, wetland-loving tamarack trees, extremely large aspen trees, and the protected prairie fen. 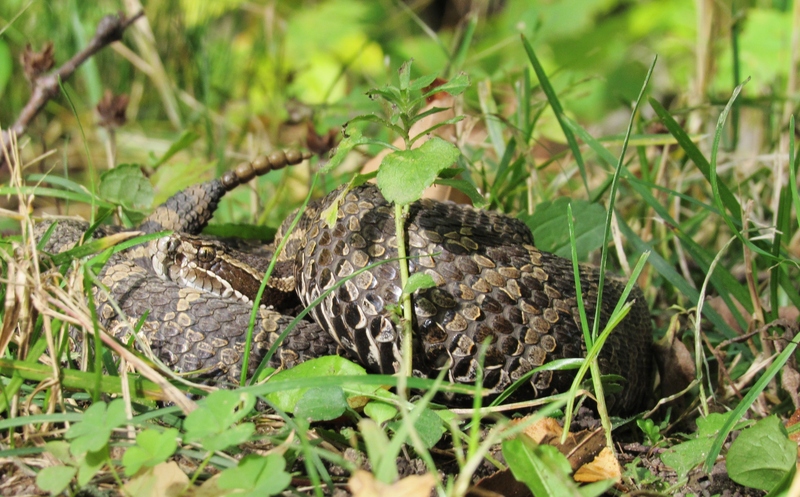 The prairie fen is ideal habitat for all sorts of well camouflaged creatures, including Michigan’s only venomous snake, the Eastern Massasauga Rattlesnake, a threatened species that coexists with the small population of Poweshiek skipperling butterflies, the most Endangered Species of Michigan. The entire Shiawassee Basin Preserve described in one word: beautiful. But to get a feel for the Davis Lake Overlook section, one would need to walk slowly and absorb the sights, sounds, and scents of summer. The heavily wooded sections are hilly and bisected by an old two-track that functions as a trail; while other parts of the primitive trail near the fen are not much wider than a deer path meandering through shrubs and wildflowers that are chest high. It’s the kind of place where one goes to quietly embrace nature’s way and revel in the wild moments of nature. During our exploratory hike I chatted with Michael Belitz, a research assistant from Central Michigan University. Belitz is very educated on the behavior of Poweshiek skipperling and its struggle to not just survive, but perhaps, hopefully, thrive in Springfield Township. Click here for more information from the U.S. Fish and Wildlife Service on the fight to save the species from extinction. As we hiked, we talked about the “forest forensics” of the Shiawassee Basin, including the formation of Davis Lake, a “kettle lake” created by a giant block of glacial ice that depressed the soil creating a water holding “kettle.” Progressive management techniques are in place at the preserve. One of those techniques is carefully timed prescribed fire, a critical component for keeping the habitat healthy for butterflies, massasauga rattlesnakes and dozens of other native species of flora and fauna. 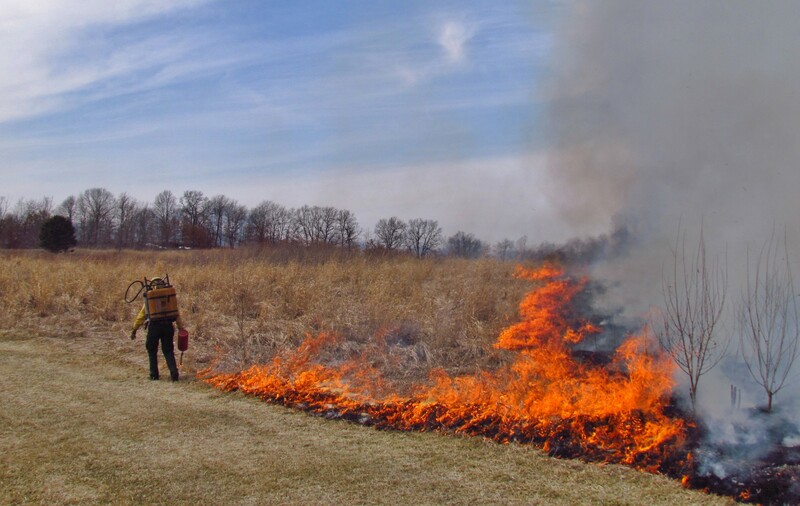 Below is a controlled burn I participated in at the Shiawassee Basin about five years ago. The wildflowers of midsummer that are now blooming are exceptional. 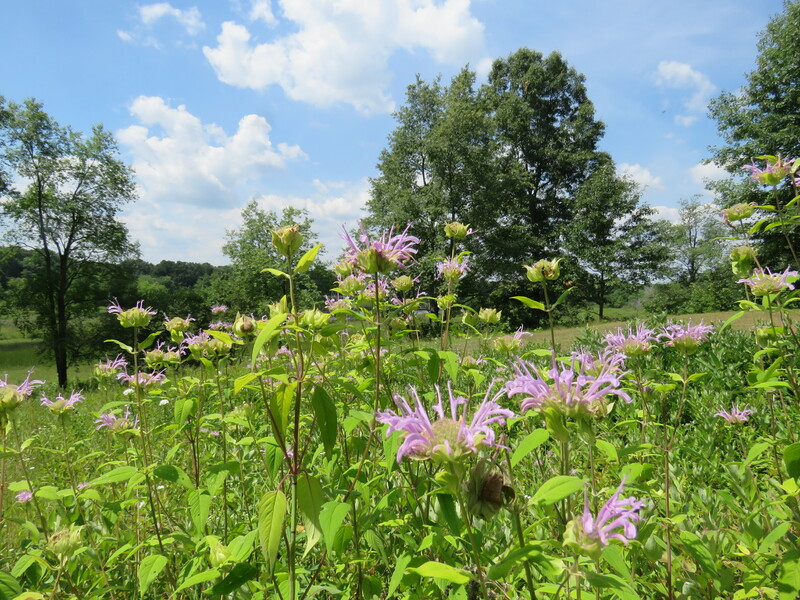 The list is long with brilliant purple Marsh Blazing Stars being standouts amidst fields of Black-Eyed Susans, with Joe-Pye weed clustered about small springs. Fun fact: Springfield Township gained its name for the abundance of springs, a factor that decreased the chance of early development and made farming difficult. 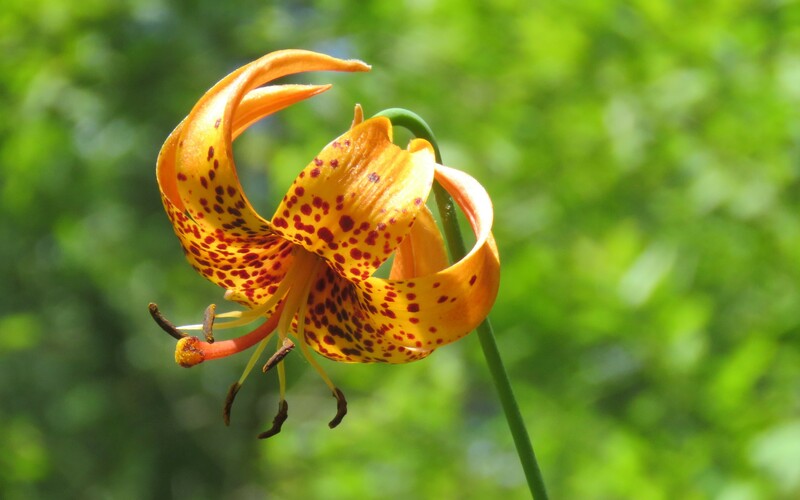 As we wrapped up our hike, we stopped to admire a few clusters of late-blooming Michigan Lily (Lilium michiganense), a spectacular beautiful native species of lily that survives at the woodland’s edge. Their spotted backward curving tepals that expose stamens and pollen confirmed the identification. For the latest county news and events, visit our website and follow along using #OaklandCounty on our Facebook, Twitter, Instagram, YouTube, Pinterest, and LinkedIn pages.